Perioperative Blood Management (PBM) is a multi-disciplinary, evidence-based, comprehensive approach to insure that the Right Patient gets the Right Amount of the Right Blood Product and the Right time. 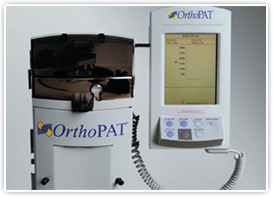 PBM includes compiling an individualized program from a range of services, technology and equipment that best meets the needs of your facility. Suncoast Perfusion Services allows you to obtain all services, technology and equipment you need for a high quality PBM program from one provider. Suncoast Perfusion Services will also continue to give you support and guidance where needed. The blood supply is a limited resource that should be conserved whenever possible. Implementing a PBM program protects this precious resource and provides a safe and cost effective alternative to allogeneic transfusions. The cost of blood is significant and always increasing. 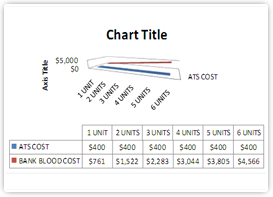 The graph to the left shows the economic benefits of using the fixed cost of Autotransfusion services vs. incurring the rising cost of each unit during and after surgery. This table assumes that the total acquisition and processing cost per unit is $761.00. 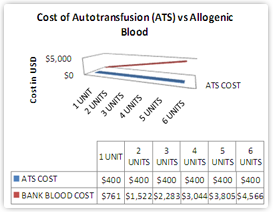 Even if a single unit is required, Autotransfusion is economically viable. No matter how many units are processed the charge remains the same for ATS. Suncoast Perfusion Services has teamed up with companies such as Haemonetics to provide a completely comprehensive suite of blood management solutions to meet cost-reduction demands, reduce waste, and provide a higher standard of patient care. To help our customers achieve a higher standard of patient care, we guide you through an effective blood management approach which includes services, devices, actionable information to guide transfusion practices and ongoing measurements to change behavior. Suncoast uses a data –driven approach in helping to establish best practices in blood management and partnering with our customers to implement recommendations that optimize the facilities blood product usage. Each facility is unique and therefore data collection must be the starting point for an effective blood management program. Using IOL, our team will compile 3 years of past data from your separate hospital computer systems. The Suncoast team will then present the data along with a suggested plan of action to best optimize blood products and patient outcomes at your facility. We will continue to guide the blood management team as well as help in educating medical staff on new standards of care. We will continue to collect live data from your facility so that we can show improvements, changes in behavior and cost reductions. Suncoast can provide you with devices to help achieve your blood management goals. We take the hassle out of choosing devices for you, we have access to all devices on the market have vetted them all and use only the best on the market. You can trust us to guide you in the direction that is best for your facility. We offer devices to track blood products from donor to recipient, calculate the amount and type of blood product needed for a specific patient, track blood product usage, store and distribute blood products, process autologous blood and provide cardiopulmonary support. We offer training, in-services and ongoing support for devices at your facility. Suncoast Perfusion Services has become the only free standing perfusion company in the nation to be accredited by The Joint Commission under their Ambulatory Health Care program. We pride ourselves in the highest quality of services provided by highly trained professionals. Suncoast offers our customers the options of service only for perfusion, Autotransfusion and platelet gel procedures or a complete program including the service, machines, disposables, insurance, policy and procedures, QC/QA, in-services and consulting. Suncoast Perfusion services was established in 1998 in Naples, Fl. 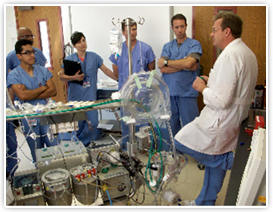 Our staff has years of expertise in developing perfusion programs in heart centers new and existing. 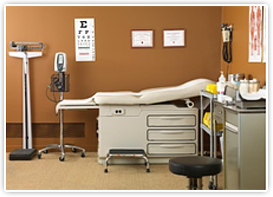 We offer a complete, customized suite of services that positively affects patients, staff and your bottom line. Our staff are available for your facility 24/7 365 days a year. Suncoast Perfusion is the First in The Nation to become accredited by The Joint Commission under their strict Ambulatory Health Care program. The level of quality, skill and continuing education of our clinical professionals promotes the safety of our patients and the peace of mind of our clients. WHY CONSIDER CONTRACT PERFUSION SERVICES? 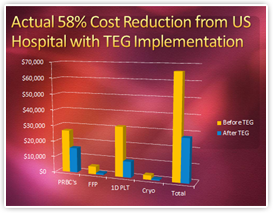 Each year an increasing amount of hospital administrators and surgeons are realizing the proven effectiveness of outsourcing their perfusion program to experts in the field. WHY IS SUNCOAST PERFUSION YOUR BEST CHOICE OF PROVIDERS? IMPACT ONLINE is a Blood Management Business Intelligence Portal made by Haemonetics. IOL provides actionable data for measurable results. Information specific to your facility is key to achieving a truly optimized blood management program. 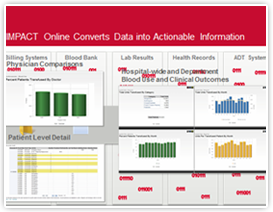 IMPACT Online is uniquely designed to convert individual data into relevant organizational goals, empowering hospitals to achieve optimal blood management. 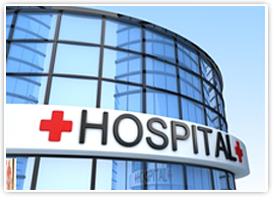 Impact online provides a hospital-wide executive summary of blood use and clinical outcomes and also provides detailed metrics for transfusion service, orthopedic and cardiovascular surgery. The robust and expanding database can also benchmark an organization against other institutions similar in size, type and geography. 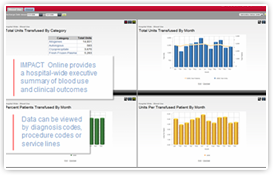 Compare blood product use and clinical outcomes by physician on a monthly basis in order to effectively manage performance. Evaluate patient outcome factors such as length of stay, complication and infection rate, hemoglobin management metrics and anemia management metrics. Benchmark your institution against other institutions clinical metrics. The Blood Track suite of solutions is an extension of your hospital’s blood bank information system. The Blood Track system secures, verifies, and monitors your blood supply chain electronically from the blood bank to remote storage locations, to the nurse’s station and finally to the patient’s bedside. As a result, customers who have implemented the Blood Track suite of products have seen an increase in patient safety, a decrease in blood inventory needed and a significant reduction in staff workload. The Blood Track system helps ensure compliance with industry standards and regulations concerning blood traceability, access, reissue, and record keeping. Studies show that 98% of patients want their own blood back rather than to receive bank blood. 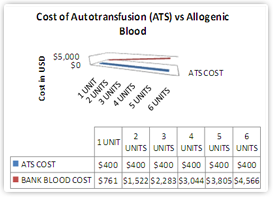 Providing Autotransfusion on one procedure can save thousands of dollars.